CLS Blue Sky Blog: The Shrine of the Status Quo? Browse: Home » 2014 » July » CLS Blue Sky Blog: The Shrine of the Status Quo? The above quotes are from John Coffee’s latest Columbia Law School Blue Sky Blog article, High Frequency Trading Reform: The Short Term and the Longer Term. The CLS Blue Sky Blog publicly addresses market regulatory issues fairly often, and John Coffee Jr is an editor and thoughtful contributor. He is the author of the above mentioned article, and we urge you to take the time to read it, as it analyzes the issues surrounding market data “inequity”, colocation, Reg NMS, regulator competition, and the Lanier v. Bats Exchange Inc. lawsuit. Coffee reminds us how a decade back, the SEC repressed the large conflicts of interest embedded in the brokerage security analyst function, and it took AG Spitzer to engineer a global settlement, in which the SEC was basically a tag-along participant. Coffee shows the parallels to today’s AG Scheiderman Barclays action, and points out that competition among regulators appears to be desirable. If the SEC is unlikely to do anything substantive in the short term, Coffee points out that the door is then wide open for folks like AG Schneiderman, as well as the plaintiff’s bar. He points out that the Lanier v. Bats Exchange et al lawsuit is quite sophisticated, which is what we have pointed out to you in the past as well. The lawsuit is brought by Michael T. Lewis, who took on Big Tobacco (he sued the tobacco companies not representing the victims, but instead the states), with the aid of Mercer Bullard, a former SEC Assistant Chief Counsel. Their lawsuit is about state tort law. Their lawsuit has some procedural issues, but those are not insurmountable. Make no mistake – this lawsuit is deeply scary to stock exchanges, the brokerage industry, and regulators alike. Coffee takes you through the lawsuit’s major thesis. Coffee goes on to examine Reg NMS – and notes that the SEC could update Reg NMS to recognize that the release of stale market information is not “useful” or “fair” and could be “deceptive.” Today HFT is compensated by “maker rebates” and by trading advantages. Those advantages are costly and can’t be computed or estimated, although it often is. In a “reformed world” we would allow for the former, but not those trading advantages. While spreads may widen a touch as a result, many would accept that tradeoff for a market with greater integrity. 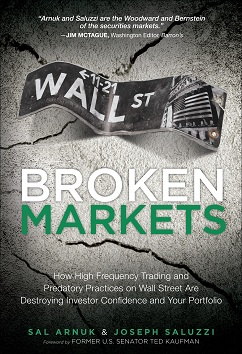 And while many are quick to defend those trading advantages by noting that there have always been advantages in place for subsets of market participant, even SIFMA – the industry’s lobbying group, advocates for precluding private feeds to preferred traders. Please read Mr. Coffee’s excellent analysis of the trading reform conundrum we all now face, and bookmark this blog in general for future articles.